I’d had enough. I couldn’t take it anymore. I had to get away. My plan was to get in the car and just drive until I found what I needed. I was trapped, before I could even get out of town. I wasn’t going anywhere. The news was all over the television. Right there on The Weather Channel. Yeah, I said The Weather Channel. The whole story played out, right there in front of me, as I contemplated my escape from the dull, gray rain and snow of Winter 2010. The weather radar swept the maps – state after state after state. No blue skies. No warm temperatures. No sun. Anywhere. None to be found in any of the places where it usually hides out during the winter. The same story in Tampa, Mobile, New Orleans, Houston, Corpus Christi, Brownsville, Atlanta, Birmingham, Jackson, Shreveport, Dallas, Lubbock, Raleigh, Charlotte, Knoxville, Nashville, Memphis, Tulsa or Oklahoma City. No sun. Anywhere within a two-day drive was no better off than I was here. Even if I got in my car and drove as far as Key West – no sun. Thanks for nothing Sunbelt States! Unless I was willing to go north and west – as far as balmy Vancouver, where the weather was unseasonably warm for the Winter Olympics – I was stuck with winter. There was nothing left to do but curl up on the couch, under a bright red and yellow quilt, with a mug of hot chocolate and a good book. Of course, it was a cookbook. And that’s when it happened. It hit me like a tumbling crate of sunny grapefruit . . . and lemons . . . and oranges. The bright colored citrus fruits of winter’s warmer climates were the answer to what I couldn’t find anywhere else. I’d found what I’d been craving! A little bit of sunshine! Taking matters into my own hands, I quickly combed my files and poured over more cookbooks. I was onto something here. An antidote to winter gloom. Then I headed to the market. Success at last! Just five minutes away from my own kitchen I found all the delicious sunshine I needed. Bright, colorful, cheerful, delicious citrus fruits! American grown citrus gives us a “local-eating” option, even in parts of our country where cold weather prevents a winter growing season. Citrus fruits are generally available all year long, but they are at their peak in the U.S. during December through March, just when we need their fresh flavors and vitamin-rich nutrients the most. Nice how nature works like that! The selection I found that day was amazing! Not just oranges, grapefruits and lemons, but navel oranges, Valencia oranges, Clementine’s, kumquats, Mello Gold grapefruits, red grapefruits, pomelos, Meyer lemons, Cara Cara oranges, and my very favorite – blood oranges. I had to pass on the Buddha’s Hand citron though – it was just a little too weird – but be sure to check that one out, if you get a chance. So what are citrus fruits good for besides eating out of hand? Well, they are absolutely perfect for everything from beverages to desserts. They add a lively flavor to soups, pasta, rice and vegetable dishes. Their acidity makes them perfect for marinades. They give salsas and sauces a sweet-tart punch to accompany meats, poultry and seafood. My favorite way to enjoy citrus fruits though, especially during winter, is in salads and salad dressings. When everything around me is cold and dreary, I love the cheery yellows, vivid reds and warm oranges against a background of fresh greens. Sliced into rounds, they call to mind all the beautiful colors of sunrises and sunsets. The tart, refreshing flavors also remind me that winter won’t last forever – just when I need to believe it most. This month’s recipe collection is all about salads with citrus fruits that taste great and offer healthy eating options. Pair them with soups and sandwiches for lunch, or stews, pastas and casseroles for dinner. It’s also an easy way to add an extra serving or two of fruit to your daily diet, and that’s always a good idea. I’ve given you recipes that pair salads and dressings, but all of them are perfect for substitutions and additions. Personalize at will! Mix and match the fruits to use what you have on hand. Switch the dressings around to discover new flavor combinations – the Cinnamon Vinaigrette and Cumin Vinaigrette were my favorites! Substitute cheeses and toasted nuts to suit you tastes. The possibilities are endless. Experiment, make it your own – and enjoy! A word to the wise – just be sure to tuck these recipes away, in case you can’t chase the sun next winter and need to create your own sunshine at home. I guarantee they have the power to lift your spirits and help you get through the last bit of winter. Place salad greens on individual plates. Place avocado slices, grapefruit sections and strawberry slices on top of greens. Top with crumbled feta cheese and Spiced Pecans. Drizzle with Raspberry Vinaigrette and serve. Combine first 8 ingredients in a large bowl; mix well with wire whisk. Add pecans; stir until evenly coated. Spread pecans in a greased 15 x 10 x 1” jellyroll pan. Bake at 275 degrees for 50-55 minutes; stir once while baking. Remove to waxed paper while still warm; cool. Store in an airtight container and use in salads all winter long. Whisk together first 7 ingredients. Gradually whisk in olive oil to blend completely. Gently wash and dry butter lettuce leaves. Remove stalks and core from fennel bulb; slice very thinly. Remove small slices from both ends of orange; sit flat end on cutting board and remove peel and pith with vertical slices. Slice oranges into ¼-in. round slices. Arrange lettuce leaves on four salad plates; top with orange slices, fennel slices and crumbled goat cheese. Drizzle with Cumin Vinaigrette. Serves 4. Combine all ingredients in a small bowl and mix well with a wire whisk until thoroughly blended. Preheat oven to 400 degrees. Wash and scrub whole beets in skins. Place inside large sheet of foil and fold into sealed packet. Roast beets until tender all the way through – about 45-60 minutes. Cool, slide skins off and dice beets. Cut small piece off both ends of orange; slice downward to remove all peel and white pith. Slice horizontally into ¼-in. rounds, or between membranes for vertical slices. Heat pecans in a skillet over medium heat, stirring and turning until warm and fragrant; cool and chop. Layer individual salad plates with lettuces, beets, blood oranges, goat cheese and toasted pecans. Drizzle with Citrus Vinaigrette. Serves 4-6. Mix all ingredients; stir to blend thoroughly. Adjust seasoning to taste. Slice ends off both ends of the oranges; with vertical slices, remove peel and white pith. Slice next to both sides of each membrane to remove orange sections; set aside. Slice olives into halves; set aside. Just before serving, toss oranges, olives and baby greens with Red Wine Vinaigrette; divide equally between four salad plates. Garnish salads with feta cheese and walnuts. Serves 4. Place first seven ingredients in a small bowl and blend whisk together. Pour a steady stream of olive oil and continue to whisk until blended. Slice oranges on each side of membranes and remove sections. Combine oranges, strawberries, onion, pecan and lettuce in a bowl and drizzle with Cinnamon Vinaigrette; toss gently to coat. Divide salad evenly between six salad plates. Serves 6. Combine all ingredients in a jar; cover tightly and shake vigorously. Chill for several hours. Shake well before serving. Place greens on four individual salad plates. Layer grapefruit and avocados on top of greens. Sprinkle feta cheese over fruit. Drizzle with Balsamic Vinaigrette. Serves 4. In a large bowl, stir together carrots, celery root, raisins and walnuts. Pour Meyer Lemon and Honey Vinaigrette over carrot mixture and toss to blend. Serves 4. Remove the skin and white pith from the grapefruit. Working over a bowl, use a sharp knife to remove the grapefruit sections from the membranes. Squeeze the juice from the membranes into the bowl. Pour the juice into a saucepan and set aside the bowl with the grapefruit sections. Crush the thyme leaves with the back of a spoon; add them to the saucepan. Add the white wine and honey to the saucepan. Simmer the saucepan over medium-low heat until the sauce is reduce to ½ cup – about 15 minutes. Strain the syrup into a bowl to remove the thyme; let cool to room temperature. Arrange the grapefruit sections in stemmed glasses and drizzle with syrup. Garnish with a sprig of thyme. Serves 4. Oh! 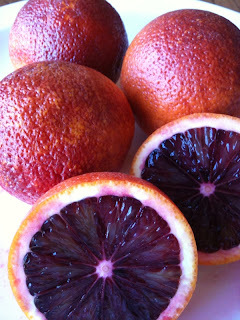 Blood Oranges - Can Spring Be Far Behind? Gorgeous on the outside . . . Stunning on the inside . . . Perfect in a winter salad. One of the truly bright spots in an otherwise dreary winter is the appearance of seasonal citrus in the market -- especially my favorite, blood oranges. The uncharacteristic deep red blush on the outside of this amazing orange is a giveaway that there is something unusual and delightful on the inside. Slice one open and take in the wonder of the truly blood red flesh or the orange. Just one taste and you are hooked. The sweet, tangy citrus flavor mingles with the suprising red, ripe flavor of berries. Too, too unbelievably good! Thank goodness the season for blood oranges comes when it does. I'm always ready for salads by the time the dead of winter gives way to tiny crocus bulbs and precious extra minutes of light at the end of the day. I want to rush headlong into spring, so I tend to force it with salads. And thank goodness that the season for blood oranges is short. Their fleeting appearance portends the changes to come -- a reminder of the cycle of life. Preheat oven to 400 degrees. Wash and scrub whole beets in skins. Place inside large sheet of foil and fold into sealed packet. Roast beets until tender all the way through – about 45-60 minutes. Cool, slide skins off and dice beets. Cut small piece off both ends of orange; slice downward to remove all peel and white pith. Slice horizontally into ¼-in. rounds, or between membranes for vertical slices. Heat pecans in a skillet over medium heat, stirring and turning until warm and fragrant; cool and chop. Layer individual salad plates with lettuces, beets, blood oranges, goat cheese and toasted pecans. Serves 4-6.